Summary: The Church of the Descent of the Holy Spirit is unique in all of Romania for its unusual proportions. It is by far the tallest and narrowest church ever built. Its walls are not painted, but decorated with stone carvings. 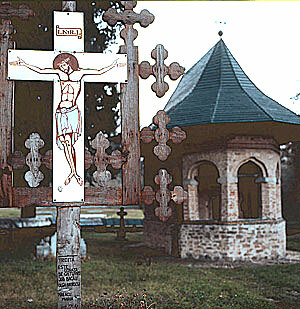 The small chapel in the cemetery of Dragomirna, just outside the walls, was built in 1602 and is considered to be the scale model of the church of the monastery. 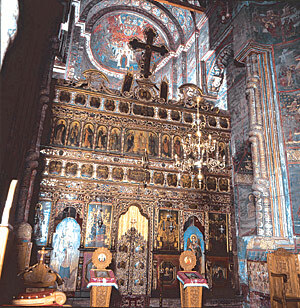 In 1602, at the Metropolitan Bishop Anastasie Crimca’s initiative, a small monastery chapel dedicated to St. John the Evangelist and the Prophets Elijah and Enoch, was built not far from the city of Suceava. Although of very reduced dimensions, the chapel was innovative in plan and the handling of space. 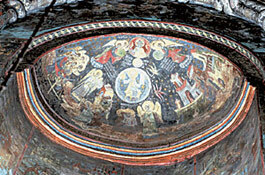 It has a rounded chancel, a rectangular naos and, instead of a pronaos, an open three-sided exonarthex. The three openings and two open doorways have massive pillars on both sides and oriental ogee arches. The polygonal west end of the building traces its origin to the much older church of Bălineşti, and perhaps to some wooden churches. The chapel is built with bricks and rough blocks of stone. A decorative band, made up of three rows of enamelled green and turquoise bricks, encircles the building just below the windows and openings. The narrow, tall shape of the church seen from the east. In a few years the chapel had become too small, and by 1609 Bishop Crimca had built a new church, with the aid of Great Chancellor Luca Stroici. 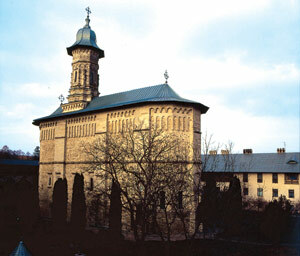 The church, dedicated to the Descent of the Holy Spirit, is incomparably taller, unique not only to Moldavia, but also to all of Romania, and even to the whole Orthodox world. The relation between the width, length and height of the church is most unusual. The church is nine metres wide, which is an average width, but the height of more than 40 metres up to the top of the lantern tower, makes it seem extremely narrow. The church gives the impression of being a ship, the old symbol of the Christian Church. The façades are built of rough yellow sandstone. 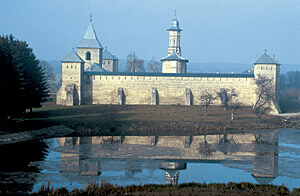 A view of the monastery and its lake. The small chapel built before the main church is situated in the woods on the left. The buttresses and corners are built of ashlars, forming wide smooth vertical bands running all the way up to the roof.Midway up the façades, a twisted stone cable encircles the church, a Walachian influence. The most spectacular element is the lantern tower. 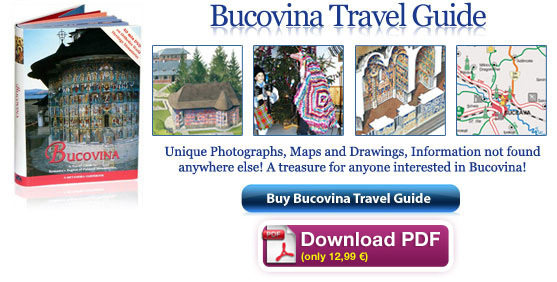 It is entirely sculpted with geometric and floral motives of Caucasian origin. Also the three bases of the tower, one square and two star-shaped, are covered with decorations. 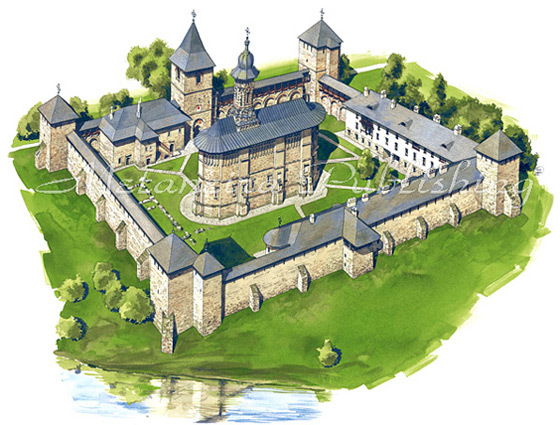 In 1627, Prince Miron Barnovschi, a relative of the Movilă family that built the monastery of Sucevita, started building the strongest monastic fortress in Moldavia. 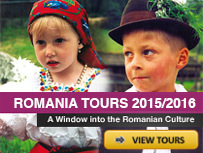 Up to this time Dragomirna had been vulnerable, a prey to robbers and marauders. The iconostasis of the church is extremely tall, fulfilling the needs of this space. It is dated from the 18th century. Part of the new monastic buildings have been transformed into a museum, where precious objects and manuscripts are displayed.A catwalk goes around the precinct walls. The view afforded from the catwalk of the east wall brings out the special character of the church. Its height and elegance are accentuated, and the whole church seems to float in the air.Outside the gate tower is the Moldavian coat of arms, the head of an aurochs inside a nearly exaggeratedly elongated four-lobed field. Carved stone rosettes decorate the arch of the gateway on both sides. On the outside, under the coat of arms, is a big modern mural painting of The Holy Virgin and Child Adored by Two Archangels. On the inside, are two smaller paintings. Further up is The Mandylion, the face of Jesus imprinted on a piece of cloth. This scene is often painted on the doorway of the naos to remind people leaving the church of the most important face to remember. The placement here, at the exit of the monastery, serves the same purpose. 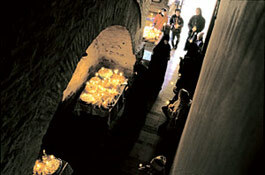 Below it is The Hospitality of Abraham, the three angels symbolizing the Holy Trinity. 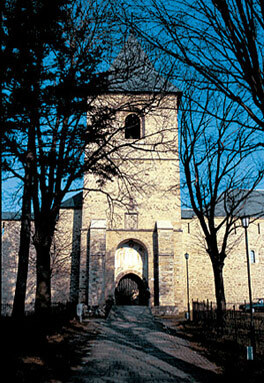 The entrance to the monastery is through a gate set in the massive gate tower. 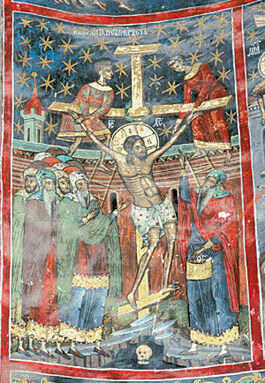 Putting Jesus on the Cross, a scene in the south apse. Commemorative candles create a sea of light in Dragomirna. A painted hymn, Jesus, the Only Son, on the vault of the south apse.